Lights, campervan and ACTION: we are finally live with videos! Home > Blog > Lights, campervans and video ACTION! Lights, campervans and video ACTION! 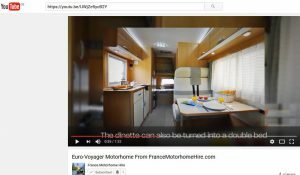 “Our motorhome range” and “How to” videos on our You Tube channel are coming soon! Recently, clients have been asking us to make videos about all sorts of things, from our vehicle range to the vehicle handover briefings. We are definitely going to do these videos, plus others on all sorts of interesting and useful subjects. In fact, we are in the process of writing scripts, appointing a cameraman and figuring out how to edit them! As soon as we add each video we will share it with you. We are keen to share client videos too, so please share any great footage you have from your campervan trip with us on Facebook and Google+.